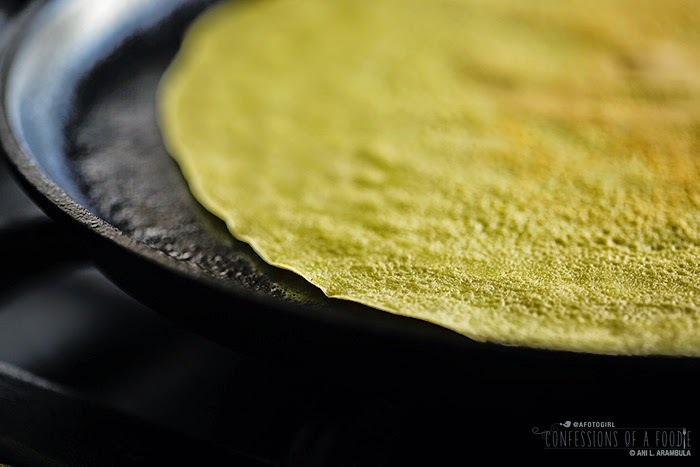 Garbanzo bean flour, also known as chickpea flour, gram flour and besan, makes for nutritious, protein-packed savory crepe. 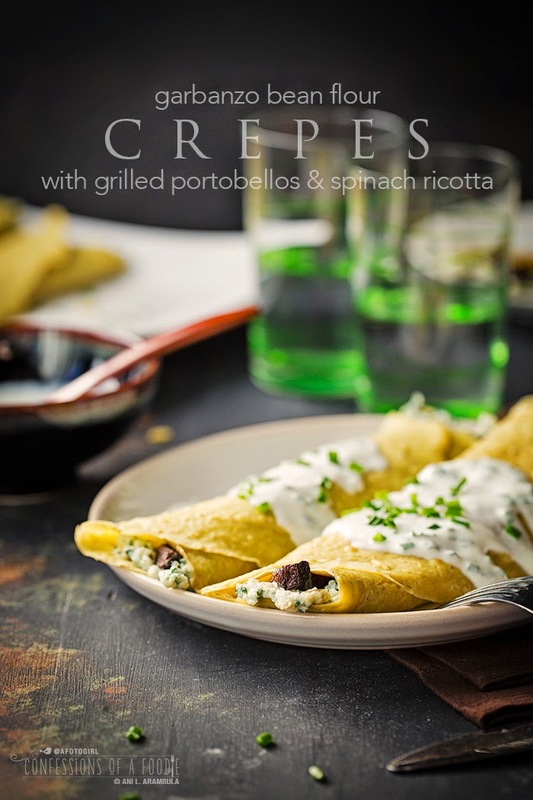 High in fiber and iron, garbanzo bean flour crepes are protein-packed and the perfect canvas to stuff with your favorite veggies. A lesson I’ve learned as I’ve walked this new wholesome. real food path: a cheat meal twice a week keeps me from binging on bad-for-me food. By the by, my “cheat” meals these days are not the calorie and carb laden over indulgences they used to be. Here’s an example: Last weekend when I did the Specialty Produce tour - not being a morning person - I stumbled out of bed, dressed and drove down to the event early enough to ensure I’d get good parking, which meant skipping breakfast. By the time the tour was over three hours later, I was famished. I got home in time to catch my auntie who always goes out for breakfast or lunch every weekend before running her errands. I asked to join her. We went to iHop because she wanted waffles. I absolutely adore their chicken florentine crepes. 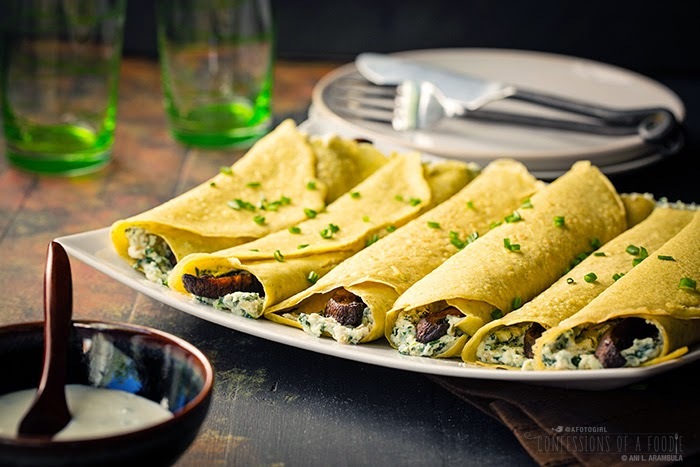 The crepes are filled with grilled chicken, sautéed spinach and mushrooms. Normally, I ask them to hold the hollandaise but forgot to this time so I merely scraped it off. 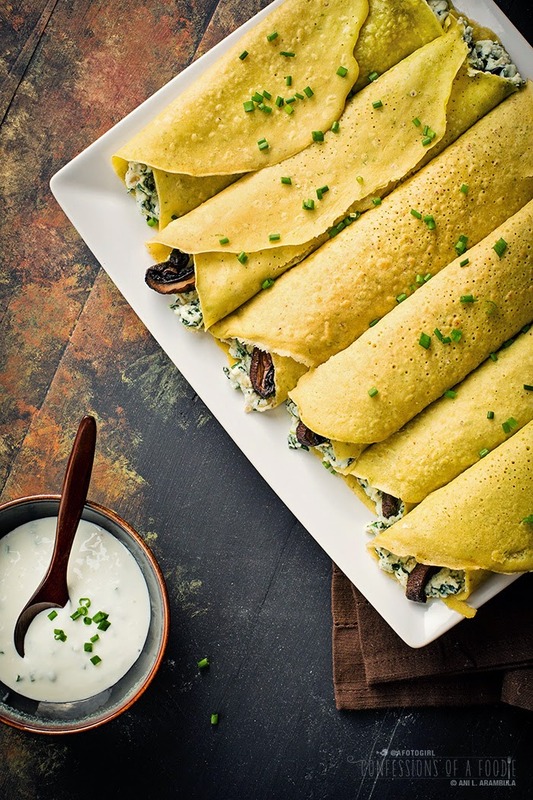 Without the sauce, these crepes are about 300 calories each and they come in pairs. I also asked for one whole grain pancake on the side (170 calories). I drizzled ½ teaspoon of blueberry syrup over my little pancake and I enjoyed my meal, guilt-free, consuming just one crepe and saving the second one for a later meal. That was my cheat meal for the weekend. Not overly indulgent but much more than my normal daily meal. It left me satiated so I could continue eating healthfully the rest of the weekend. Crepes, like pancakes, have always bean a meal I feel guilty about ordering when eating out. They have always seemed so decadent especially because I've mostly only seen sweet crepes on menus so it's like having dessert for breakfast. Plus, crepes have always been a bit mysterious to me, too, as I’ve always read about how fussy they were to make and how hard they are to master, especially in the pouring, swirling, flipping department. Earlier this year, I decided that homemade crepes were going to be on my “get over it and make it” food list (soufflés are also on this list). So I watched some videos and wound up on an Alton Brown’s “Good Eats” episode and thought, surely, I can do this. Only thing is, I'm refraining from using highly refined all-purpose white flour in my cooking and baking these days. So more research lead me to “a brown table” and Nik’s chickpea crepes (chickpeas are also known as garbanzo beans). 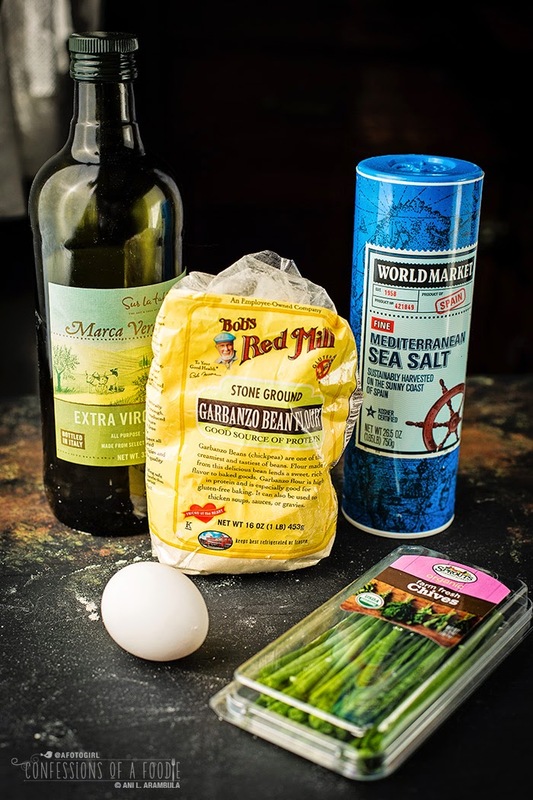 A quick perusal of my pantry told me I had garbanzo bean flour leftover from a cookie recipe I made for Starbuck. I’ve made crepes a few times now, adjusting the recipe here and there. The first time I made them was for this photo shoot. Yup. Risky, I know, to shoot my very first attempt at crepe making. But I think I did rather well. Only the very first crepe was a bit thick because I didn’t swirl fast enough. I don’t have a crepe pan. I used my trusty Lodge round griddle. Cast iron, baby! Not light. But from the second one on, I got the swirling down and made some pretty consistently sized crepes. Back to this batter, Nik’s version makes a few tweaks to the original Indian version by adding chili flakes and scallions to the basic recipe which is merely the chickpea flour, salt, water. I took it one step farther by adding an egg. I also made the mistake of adding the chives to the blender, which made the crepes a little bitter. The second time I made it, I stirred in the chives after everything else was blended so the chives where a nice punch of flavor, sans bitterness. Warning: You really need to love garbanzos if you’re going to make these. The distinctive bean flavor is front and center. I liked them. My sister Barb who was here helping me during this photo shoot enjoyed them even more than I did. To be sure, these are tasty, protein packed and totally guilt-less eats! Fill them with whatever you like. I made these for Meatless Monday but they’re delicious stuffed with grilled chicken and a few spoons of chunky tomato sauce on top. Or how about stuffing them with some curried cauliflower florets? See what I mean? Let your imagination take over and make this your own! Pour the water, flour, oil, salt, egg and cumin into a blender. 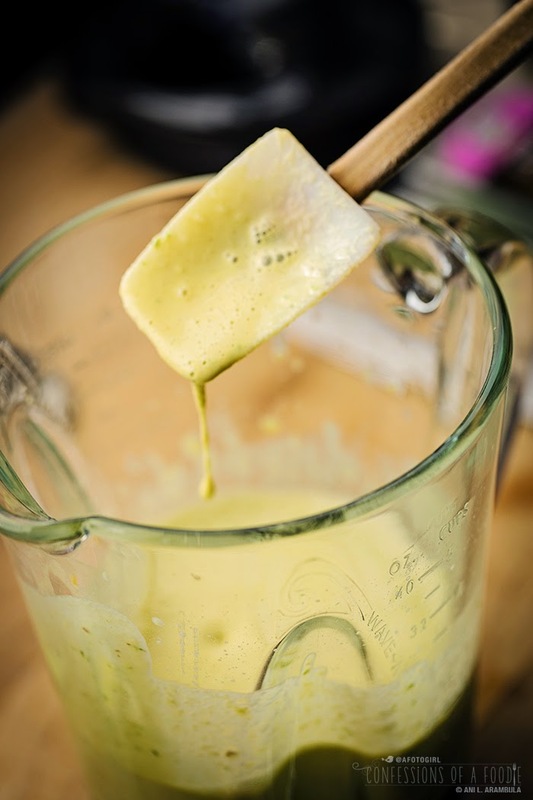 Blend on high for 10 seconds; scrape sides of jar then blend for an additional 15 seconds. Batter will be runny (about the consistency of half and half). Stir in the chives. Place in the refrigerator while you prepare the stuffing. Place a grill pan on medium high heat. Use a paper towel to remove dirt from mushrooms. Remove stem and discard it. Massage a half teaspoon of olive oil on to each side of both mushrooms. 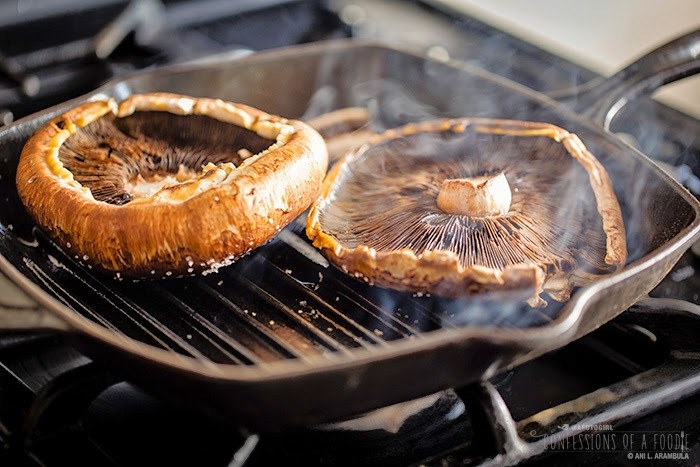 Cook mushrooms for 5 minutes on each side or until tender, to taste. 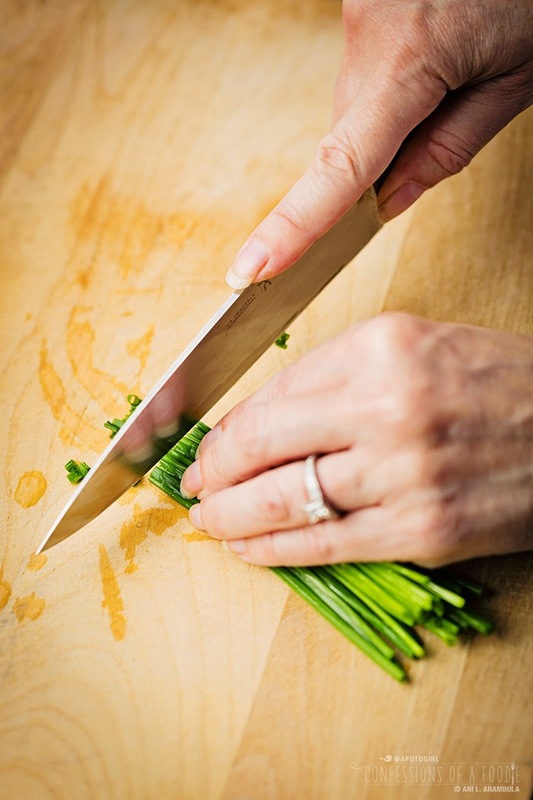 Remove to a chopping board and cut into ¼-inch thick slices; set aside. Place a 10-inch skillet on medium heat. Drizzle in 1 tablespoon of olive oil. When oil is hot and shimmering, add the chopped onions and cook, stirring until lightly golden. Add garlic and cumin, cook for 1 minute longer. 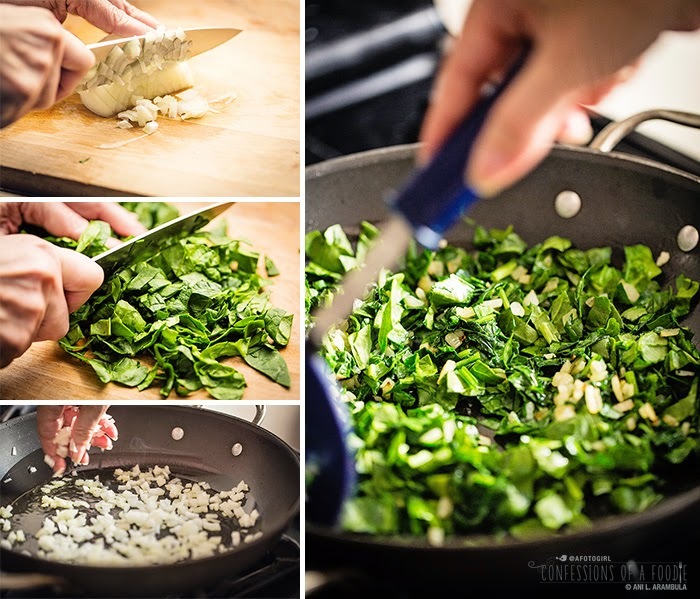 Toss in the spinach, stirring to incorporate, and cook until wilted. Remove vegetables to a bowl and allow to cool for 5 minutes. Stir in the ricotta. Add salt and pepper to taste; set aside. Add the yogurt sauce ingredients to a small bowl and stir well to incorporate. Keep refrigerated until ready to serve. 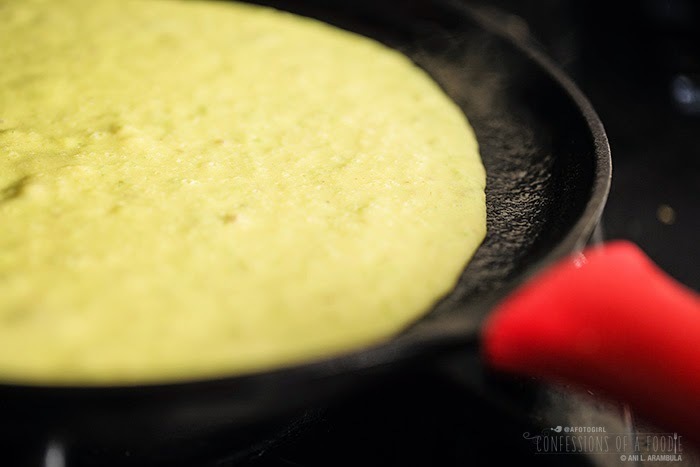 Place a round 10-inch griddle or 12-inch nonstick pan on medium heat. Spray an even coat of cooking spray (you can use butter but I found that butter burns and makes the crepes brown unevenly). Pour about ¼ cup of batter onto the center of the pan with one hand while lifting and swirling the pan with the other to make an 8 ½-inch circle. Allow to cook for about 30 - 45 seconds. 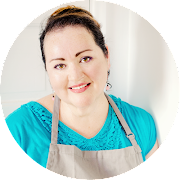 You’ll know it’s time to flip with the crepe is no longer glossy and the crepe releases without little to no resistance when you run a spatula along the outer edges (use a thin, flexible spatuala like a fish spatula). Cook for 15 - 20 seconds on the second side or until the edges begin to lift from the pan. Remove to a chopping board. Cover with a clean dish towel. Continue with remaining batter. To assemble, spread 2 - 3 tablespoons of ricotta in center of crepe. 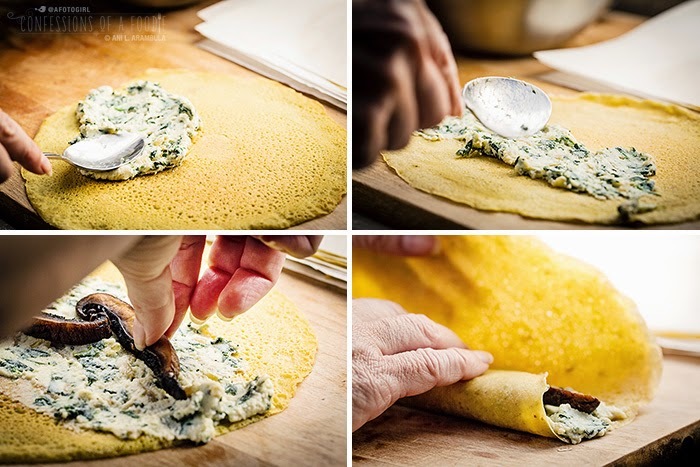 Add three slices of mushrooms then gently lift each end of the crepe towards the center. Place on a serving platter and repeat with remaining crepes. 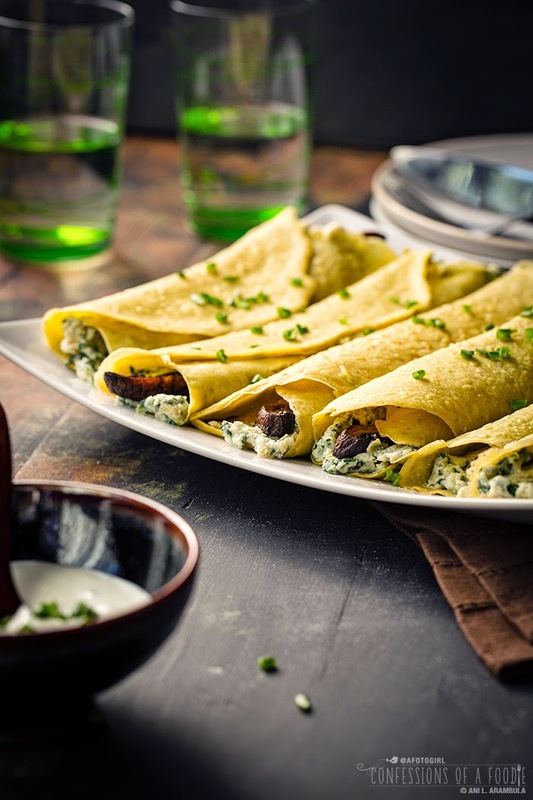 To serve, add two crepes to a plate and top with yogurt sauce and chopped chives. Leftover crepes can be stored in an airtight container for up to three days (wait to top with yogurt until ready to serve). Very complex flavors here - I'm impressed with such an original recipe. And good for you for watching calories at a restaurant - so difficult! I made this for dinner tonight and it was delicious, thanks so much! Naomi -- Hahahaha. Thank you for kind words! You should give these a whirl if you like garbanzo beans. They really are quite forgiving. I have been loving using chickpea flour lately, it is so yummy and versatile. My most recent obsession is using it as a pizza base, so dang good! 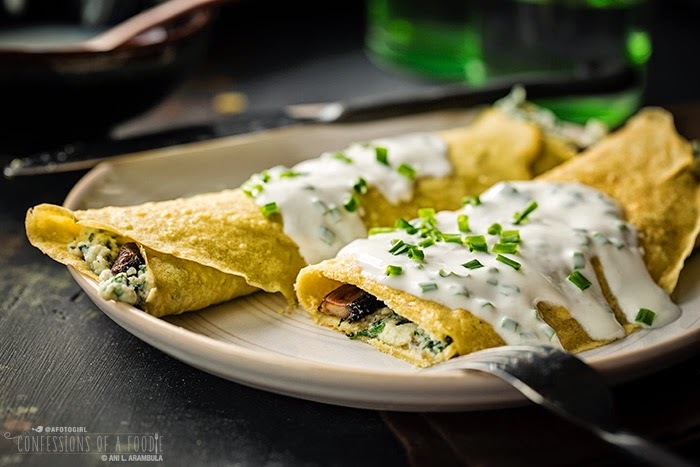 Since childhood I loved to make crepes, and until today I made few nice variations of sweet and savory crepes, but it never crossed my mind to make them with beans flour - such an original idea, I bet they taste great! 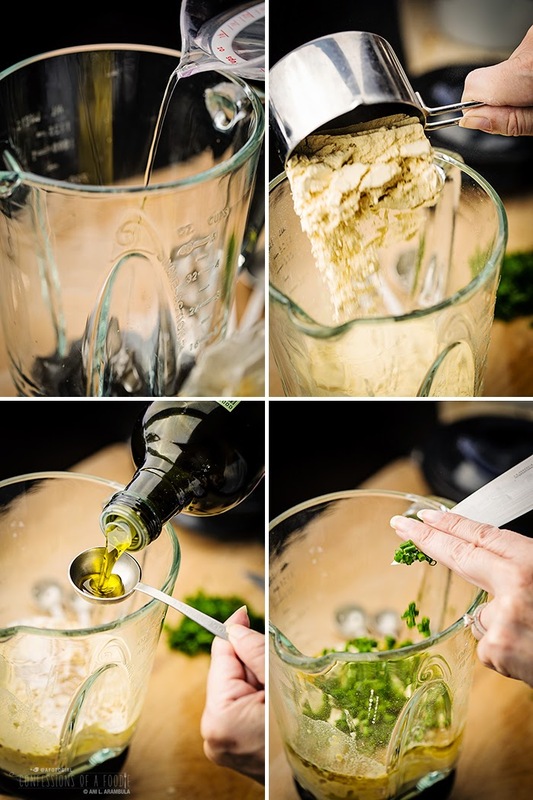 Carashealthycraving -- I need to try it as pizza dough. genius! Jasmin -- Thank you. They do! :-) Now I've got crepe fever and am itching to try making different kinds.